Fortunately for them, we stepped in. But in the process, my husband and I, who also have no children, asked ourselves the same question Sara did: Who will care for us as we age and need help? The incidence of solo agers has risen dramatically with the boomer generation. Twenty percent of baby boomers do not have children, and many that do are geographically separated from them. Right now, my husband and I have each other to rely on; however, that will not always be the case. Medical professionals and social service agencies are seeing a growing population of older adults—age 80 and over—who live alone with little to no support system. In gerontological terms, these individuals are called elder orphans. Without a social network to help care for them, they’re at risk for many challenges. In a recent University of Texas study, 78 percent of participants who identified as elder orphans had no help with bills or financial decisions, 56 percent had no help with medical decisions and 70 percent had not identified a would-be caregiver. Over one-third had no one to call in an emergency. 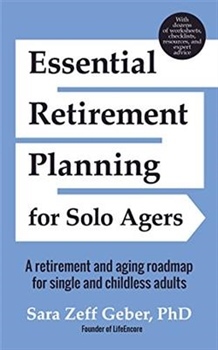 Any solo ager is at risk of becoming an elder orphan if they do not have a plan. So what can we solo agers do to prevent ourselves from becoming elder orphans? Geber was recently awarded the designation of 2018 Influencer in Aging and has spent eight years researching and studying solo agers. You can also begin a conversation in your social network about your friends’ plans for aging and what fellow solo agers plan to do when they need help. Additionally, learn what resources are available to you in your community. Social service agencies like Senior Concerns help thousands of people a year identify resources to help them live as independently as possible. Having a plan gives you control. Rather than leaving things up to chance, you get to make choices and decisions. Make sure you share your plan with those who will help you. Finally, life changes and things happen. Revisit your plan periodically.